This article was sparked by a recent experience, and I felt I should share. The last night he explained why. He read some statistics which I will share in a moment. It was about the statistical breakdown if the world had 100 people and how many would fall into different categories. He noted that, after he read the statistics, he no longer answered that he was feeling “good”, a general response many of us give many times if we are asked that question in a general greeting. He said he now answers “Great” or “Amazing” if someone asks how he is doing, because he realized that he had so much to be thankful for in his own life. Personally, I am most grateful for my life. I have a home and food to eat. I probably own 10 computers (not sure if that is a blessing? ), I have a car. I have love and a wonderful family. I have freedom. I agree and believe that responding to a “How are you doing” in a “GREAT!” manner is healthy, and I adopted saying “Excellent” a few years ago if I am asked. When I respond “Excellent”, I feel much more positive. There is a lot of research that shows counting our own personal blessings, of being in a state of gratitude, looking for the bright side, and focusing on something positive, is healthy for us. I know that it is hard to do many times, and I know it is not something I had learned to do when I was younger. During my childhood I had learned envy, jealousy and to focus on lack – not to focus on what I had and to be grateful for my life, but to focus on what I didn’t have. I wrote about this in my book, “If I Knew Then What I Know Now“, which brought the awareness to spur the proactive approach of our foundation. Through my life learning and awareness, and through a lot of reading, education and research, it has become my life purpose to provide the education, tips and tools for you and others to learn how to PREinvent YOUR Life®. What does that mean? To bring awareness, life and coping skills to others sooner than later so people have the opportunity to have their best life longer. I believe the current system in our society is reinvention and recovery, which causes us to unlearn our way of thinking and to RE-learn how to enjoy life. But, how about if we started out with the right skills at the onset so we can enjoy life the whole time? There’s a lot more to this concept which I’ve shared and will continue to share and present. In our current society, many of us are taught to focus on the negative. Don’t believe me? Just watch the news. We seem to revel in disaster or sadness. There are so many things that we can focus on, instead. There are so many people and organizations doing amazing things — so many people out there that, if we band together, can make every community the most amazing place to live for all people. In reference to gratitude, I have been reading Dr. Martin Seligman’s book Flourish. He discussed the affects of positive emotions and health benefits of those who found something to be grateful for and how the focus on something positive that happened to them, “people who habitually acknowledge and express gratitude” see benefits in their health, sleep, relationships and perform better in their life. Dr. Seligman had people reflect on one thing that happened the day before that was a “blessing” or something they were grateful for. This shift in finding one thing that we are grateful for can shift our whole perspective so we can enjoy life. I believe this to be true. Personally, if I focus on how tough my week is, how horrible something is, how _________________ (fill in the blank), I feel tired, achy, or miserable. Take a moment and reflect on yourself: How do you feel when you focus on how you hate your job, or how you are angry at someone, or how you have a lack in your life? Imagine the shift that could be possible if you focused on the positive things — the shift in your attitude, the shift in your personality. I’m not saying everything in life is perfect. Not everything is 1000% perfect in my life all the time, either. BUT, I personally know that if I dwell on the negative, I feel worse. After years of working on the Time to Play project, I have realized that the “KEY” is to recognize what I’m feeling and to dig a little — to recognize what my focus is and to figure out why I feel a specific way, especially if I am not feeling good. Once I know the “why” (the root cause), I know I can move away from the situation and shift my focus and my thinking. In the end, I know that it is always up to me to have the best day I can — no matter what the circumstances. I know that I can only control me to have an enjoyable day, which is my goal everyday. I cannot control anyone else’s behavior. I do thank Rebecca L. Norrington, our Time to Play Foundation’s happiness expert, for sparking this awareness in me many years ago. This awareness is definitely necessary to appropriately reach to life situations in a better manner to create a better life. Start easy — just focus on something, one thing, to be grateful for – whether you do it at night before you go to sleep or when you wake up to start your day — or, maybe, do both! You will notice a tremendous difference in how you feel. I guarantee it. I woke up this morning thinking about the affects our thinking has on our lives, whether positive or negative. Mike Pastore, one of the Time to Play Foundation’s amazing Board members and I had been speaking to a man this past week. He wanted nothing to do with making his life change or thinking he can make it change. He had a horrible childhood and he had a horrible life so far. I actually believe that he had did not have to experience some of his life experiences, but that circumstances actually happened because of his mindset. Now, at over 60 years old, with all of the negativity and hard life experiences that he has had so far, he has no desire to shift his thinking to change. I understand things take time and a shift of thinking takes time. But, I also understand that the average life expectancy is 78 years old. I believe it is up to us when we decide we have had enough, and that it is up to us when we decide we want something different. 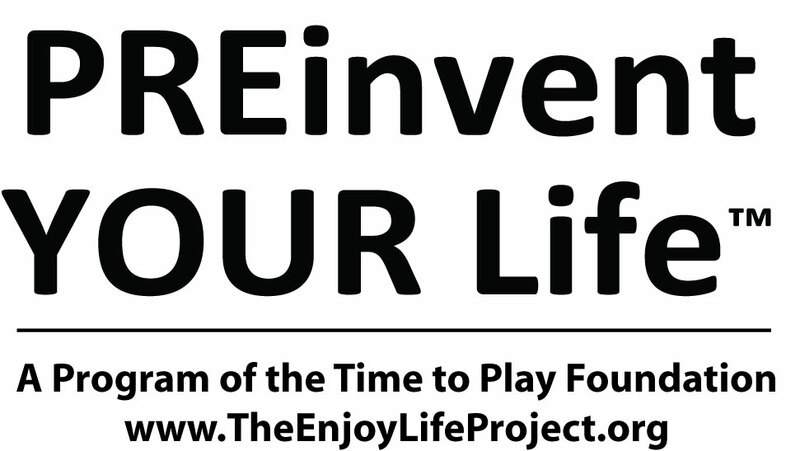 It’s the founding idea behind the PREinvent YOUR Life® program of the Foundation, and my absolute mission, vision and passion – to encourage others to have the best life they can for the longest period of time possible. Think it’s not possible for you to change the circumstances in your life? Think you were dealt “a bad hand” and things are as they are and that you can’t change the future? At this point, I believe every second of every day is a “do over” if you want it to be. We each have the ability to start fresh, and I believe that our thinking and our choices make it possible to start to do so. It is an underlying belief of the Time to Play Foundation that positive thinking goes a long way. I believe that you can make lemonade out of lemons. I say this all the time now, “I Wish I Knew Then What I Know Now”. That statement became evident a few years ago when I finally wrote the book – but, at 50 years old, I do wish I knew then what I know now when I was much younger. Even though I know I can’t change things in my past, I now know how every day could have been filled with much more sunshine if I realized how much I am the one in control of my emotions, my reactions, and my destiny. So, ask yourself: The “stuff” that happened in your past – can you change it? Ask yourself – are you happy with how your life is going right now? If you are, keep on going the way you are. If not, take a moment to evaluate what’s happening and what you can do to make one small change to make the next second, or next hour, or the next day different. 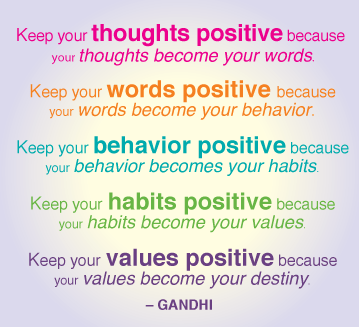 Can positive thoughts everyday make a difference in the outcome of a person’s life? There is much research to prove that it can and how much it affects everything in a person’s life. The quote by Ghandi shows this knowledge is not new. It’s just not something many of us have been taught early on. But, even though we can’t change our past, we can still PREinvent™ our next day and our next day. Please join and share our public group: https://www.facebook.com/groups/timetoplaynews. Wake up every day to a positive thought and some positive energy. We’re not trying to sugar coat things here – people have tough days. I do, too! But, I believe now that it is all in the way we handle things and our outlook, in general, that can create our experience. We encourage everyone to share positive thoughts and motivation and stories in our Facebook group so we can empower each other. That is the underlying founding principle of the Time to Play Foundation – People Helping People and Collaboration = Success. I believe everyone has something to offer that can help someone else. After all, it is time to enjoy life. It is Time to Play. Every day. Doreen Guma, MA, FACHE, CPC, CLC has worked in the healthcare field since 1987. She is a board certified healthcare executive, a certified professional life coach, the founder of the Time to Play Foundation, a 501c3 not for profit corporation inspiring everyone to enjoy life and author of If I Knew Then What I Know Now, Our Quest for Quality of Life. The concept behind time to Play and the Time to Play Foundation was absolutely created out of LOVE. Please see http://www.timetoplay.com/ for more information.